"PS4" redirects here. For other uses, see PS4 (disambiguation). The PlayStation 4 was released to acclaim, with critics praising Sony for acknowledging its consumers' needs, embracing independent game development, and for not imposing the restrictive digital rights management schemes similarly to those announced by Microsoft for Xbox One. Critics and third-party studios also praised the capabilities of the PlayStation 4 in comparison to its competitors; developers described the performance difference between the console and Xbox One as "significant" and "obvious". Heightened demand also helped Sony top global console sales. By the end of December 2018, over 94 million PlayStation 4 consoles had been shipped worldwide, surpassing lifetime sales of its predecessor, the PlayStation 3. On September 7, 2016, Sony unveiled the PlayStation 4 Pro, a high-end version of the console with an upgraded GPU and higher CPU clock rate to support enhanced performance and 4K resolution on supported games. The company also released a variant of the original model with a smaller form factor, and the release of a patch to add HDR support to all existing consoles. According to lead architect Mark Cerny, development of Sony's fourth video game console began as early as 2008. Less than two years earlier, the PlayStation 3 had launched after months of delays due to issues with production. The delay placed Sony almost a year behind Microsoft's Xbox 360, which was already approaching unit sales of 10 million by the time the PS3 launched. PlayStation Europe CEO Jim Ryan said Sony wanted to avoid repeating the same mistake with PS3's successor. In designing the system, Sony worked with software developer Bungie, who offered their input on the controller and how to make it better for shooting games. In 2012, Sony began shipping development kits to game developers, consisting of a modified PC running the AMD Accelerated Processing Unit chipset. These development kits were known as "Orbis". In early 2013, Sony announced that an event known as PlayStation Meeting 2013 would be held in New York City, U.S., on February 20, 2013, to cover the "future of PlayStation". Sony officially announced the PlayStation 4 at the event. It revealed details about the console's hardware and discussed some of the new features it will introduce. Sony also showed off real-time footage of games in development, as well as some technical demonstrations. The design of the console was unveiled in June at the Electronic Entertainment Expo 2013, and the initial recommended retail prices of $399 (NA), €399 (Europe), and £349 (UK) given. The company revealed release dates for North America, Central America, South America, Europe, and Australia, as well as final pieces of information, at a Gamescom press event in Cologne, Germany, on August 20, 2013. The console was released on November 15, 2013, in the United States and Canada, followed by further releases on November 29, 2013. By the end of 2013, the PS4 was launched in more European, Asian and South American countries The PS4 released in Japan at ¥39,980 on February 22, 2014. Sony finalized a deal with the Chinese government in May 2014 to sell its products in mainland China, and the PS4 will be the first product to be released. Kazuo Hirai, chief executive officer of Sony, said in May: "The Chinese market, just given the size of it, is obviously potentially a very large market for video game products ... I think that we will be able to replicate the kind of success we have had with PS4 in other parts of the world in China." In September 2015, Sony reduced the price of the PS4 in Japan to ¥34,980, with similar price drops in other Southeast Asian markets. The first official sub £300 PS4 bundle was the £299.99 "Uncharted Nathan Drake Collection 500GB", released in the UK on October 9, 2015; a 1 TB £329.99 version was offered at the same time. On October 9, 2015, the first official price cut of the PS4 in North America was announced: a reduction of $50 to $349.99 (US) and by $20 to $429.99 (Canada). An official price cut in Europe followed in late October 2015, reduced to €349.99/£299.99. On June 10, 2016, Sony confirmed that a hardware revision of the PlayStation 4, rumored to be codenamed "Neo", was under development. The new revision is a higher-end model that is meant to support gameplay in 4K. The new model will be sold alongside the existing model, and all existing software will be compatible between the two models. Layden stated that Sony has no plans to "bifurcate the market", only that gamers playing on the Neo will "have the same experience, but one will be delivered at a higher resolution, with an enhanced graphical experience, but everything else is going to be exactly as you'd expect". The high-end console was publicly revealed on September 7, 2016, as PlayStation 4 Pro. At the same time, Sony unveiled an updated version of the original PS4 model with a smaller form factor. In May 2018 during a presentation to investors, Sony Interactive Entertainment CEO John Kodera stated that the PlayStation 4 was heading into the end of its lifecycle, and that the company was anticipating decreasing year-over-year hardware sales. He explained that Sony would be countering the expected decline by focusing on "strengthen[ing] user engagement" including continued investments into new first-party games and other online services for PS4. "We will use the next three years to prepare the next step, to crouch down so that we can jump higher in the future," Kodera added in an interview with the press the following day. The technology in the PlayStation 4 is similar to the hardware found in modern personal computers. This familiarity is designed to make it easier and less expensive for game studios to develop games for the PS4. "[We] have not built an APU quite like that for anyone else in the market. It is by far the most powerful APU we have built to date". The PlayStation 4 uses an Accelerated Processing Unit (APU) developed by AMD in cooperation with Sony. It combines a central processing unit (CPU) and graphics processing unit (GPU), as well as other components such as a memory controller and video decoder. The CPU consists of two quad-core Jaguar modules totaling 8 x86-64 cores, 7 of which are available for game developers to use. The GPU consists of 18 compute units to produce a theoretical peak performance of 1.84 TFLOPS. The system's GDDR5 memory is capable of running at a maximum clock frequency of 2.75 GHz (5500 MT/s) and has a maximum memory bandwidth of 176 GB/s. The console contains 8 GB of GDDR5 memory, 16 times the amount of RAM found in the PS3 and is expected to give the console considerable longevity. It also includes secondary custom chips that handle tasks associated with downloading, uploading, and social gameplay. These tasks can be handled seamlessly in the background during gameplay or while the system is in sleep mode. The console also contains an audio module, which can support in-game chat as well as "a very large number" of audio streams for use in-game. All PlayStation 4 models support high dynamic range (HDR) color profiles. Its read-only optical drive is capable of reading Blu-ray Discs at speeds of up to three times that of its predecessor. The console features a hardware on-the-fly decompression module boosting optical disc reading speed and buffer unread data when a game is not actively accessing the optical drive. The original PS4 model can output in 4K and play multimedia in the format, but does not play games in 4K. The console includes a 500 gigabyte hard drive for additional storage, which can be upgraded by the user. System Software 4.50, which was released on March 9, 2017, enabled the use of external USB hard drives up to 8 TB for additional storage. The PlayStation 4 features Wi-Fi and Ethernet connectivity, Bluetooth, and two USB 3.0 ports. An auxiliary port is also included for connection to the PlayStation Camera, a motion detection digital camera device first introduced on the PS3. A mono headset, which can be plugged into the DualShock 4, is bundled with the system. Audio/video output options include HDMI TV and optical S/PDIF audio. The console does not have an analog audio/video output. The PS4 features a "Rest mode" feature. This places the console in a low-power state, while allowing users to immediately resume their game or app once the console is awoken. The console also is able to download content such as game and OS updates while it is in this state. The DualShock 4 is PlayStation 4's primary controller; it maintains a similar design to previous iterations of the DualShock series, but with additional features and design refinements. Among other tweaks, the caps of the analog sticks were given a concave design (similar to the Xbox 360 controller), the shape of the triggers and shoulder buttons were refined, the D-pad buttons were given a steeper downward angle to provide a resting space in the center for the user's thumb, and the hand grips were made thicker and given microtexturing to improve their feel. A major addition to the DualShock 4 is a touchpad; it is capable of detecting up to two simultaneous touch presses, and can also be pressed down as a button. The "Start" and "Select" buttons were replaced by "Options" and "Share" buttons; the latter is designed to allow access to the PlayStation 4's social features (including streaming, video recording, and screenshot tools). 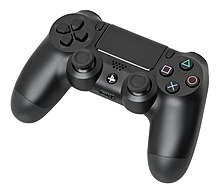 The DualShock 4 is powered by a non-removable, rechargeable lithium-ion battery, which can be charged using its micro USB connector. The controller also features an internal speaker, and a headphone jack for headsets or headphones; the console is bundled with a pair of headset earbuds. The controller's motion tracking system is more sensitive than those of the PlayStation 3's controllers. An LED "light bar" was additionally added to the front of the controller; it is designed to allow the PlayStation Camera accessory to further track its motion, but can also be used to provide visual effects and feedback within games (such as, for instance, reflecting a player's low health by turning red). Although the PS4 and DualShock 4 continue to use Bluetooth for wireless connectivity, the console is incompatible with PlayStation 3 controllers. An exception are the PlayStation Move motion controllers originally released for PS3, which are officially supported for use with the PlayStation Camera. In October 2013, Shuhei Yoshida stated on Twitter that the DualShock 4 would support "basic functions" when attached to a PC. In August 2016, Sony unveiled an official USB wireless adapter for the DualShock 4, enabling use of all of the controller's functionality on PC. In December 2016, Valve's Steam platform was updated to provide support and controller customization functionality for DualShock 4, through existing APIs for the Steam Controller. A revision of the DualShock 4 was released alongside the "Slim" and Pro models in 2016, and is bundled with these systems. It is largely identical to the original model, except that the touchpad now contains a "stripe" along the top which the light bar's LED can shine through, and the controller can communicate non-wirelessly when connected to the console over USB. The PlayStation 4 Camera, which is required for use with the PS VR. The PlayStation Camera is an optional motion sensor and camera for the PlayStation 4, similar to Kinect on Xbox. It includes two 1280×800 pixel lenses operating with an aperture of f/2.0, with 30 cm focusing distance, and an 85° field of view. The dual camera setup allows for different modes of operation, depending on the initiated and running application. The two cameras can be used together for depth-sensing of its surrounding objects in its field of vision. Alternatively, one of the cameras can be used for generating the video image, with the other used for motion tracking. PlayStation Camera also features a four-channel microphone array, which helps reduce unwanted background noise and can be used for voice commands. With the PlayStation Camera connected, different users can automatically log-on to the system via face detection. PlayStation VR is a virtual reality system for PlayStation 4; it consists of a headset, which features a 1080p display panel, LED lights on the headset that are used by PlayStation Camera to track its motion, and a control box that processes 3D audio effects, as well as video output to the external display (either simulcasting the player's VR perspective, or providing an asymmetrical secondary perspective). PlayStation VR can also be used with PlayStation Move motion controllers. The PlayStation 4's operating system is called "Orbis OS", based upon a customized FreeBSD 9. The console does not require an Internet connection for usage, although more functionality is available when connected. The PS4 is the first to include a WebKit-based web browser, which is a departure from its predecessor's NetFront browser; it is based on the same modern WebKit core as Google Chrome and Safari, giving it high compatibility in HTML5 compliance testing. The console introduces a customizable menu interface, the "PlayStation Dynamic Menu", featuring a variety of color schemes. The interface displays the player's profile, recent activity, notifications, and other details in addition to unlocked trophies. It allows multiple user accounts, all with their own pass-codes. Each player account has the option to share their real name with friends, or use a nickname in other situations when anonymity is important. Facebook profiles can be connected to PlayStation Network accounts, making it easier to recognize friends. The default home screen features real time content from friends. The "What's New" activity feed includes shared media, recently played games, and other notifications. Services from third-party vendors, such as Netflix and Amazon Video, can be accessible within the interface. Multitasking is available during gameplay, such as opening the browser or managing party chat, and switching between applications is done by double-tapping the "PS" button. The PlayStation Camera or a microphone enables the user to control the system using voice input. Players can command the interface to start a game, take screenshots, and save videos. Saying "PlayStation" initiates voice control, and "All Commands" displays a list of possible commands. The PlayStation 4 system software supports Blu-ray and DVD playback and 3D functionality. Playing a CD is unsupported, but custom music and video files can be played from DLNA servers and USB drives using the Media Player app. The PlayStation 4 allows users to access a variety of free and premium PlayStation Network (PSN) services, including the PlayStation Store, PlayStation Plus subscription service, PlayStation Music powered by Spotify, and the PlayStation Video subscription service, which allows owners to rent or buy TV shows and films à la carte. A United States-exclusive cloud-based television-on-demand service known as PlayStation Vue began beta testing in late November 2014. Sony intends to expand and evolve the services it offers over the console's lifespan. Unlike PS3, a PlayStation Plus membership is required to access multiplayer in most games; this requirement does not apply to free-to-play or subscription-based games. Smartphones and tablets can interact with the PlayStation 4 as second screen devices, and can also wake the console from sleep mode. A Sony Xperia smartphone, tablet or the PlayStation Vita can be used for streaming gameplay from the console to handheld, allowing supported games to be played remotely from around a household or away from home. Sony has ambitions to make all PS4 games playable on PlayStation Vita. Developers can add Vita-specific controls for use via Remote Play. This feature was later expanded to enable PS4 Remote Play functionality on Microsoft Windows PCs and on Apple OS X Macs. The update, released in April 2016, allows for Remote Play functionality on computers running Windows 8.1, Windows 10, OS X Yosemite, and OS X El Capitan. Remote Play supports resolution options of 360p, 540p, and 720p (1080p is available on PS4 Pro), frame rate options of 30-60 FPS, and the DualShock 4 can be connected via USB. The PlayStation App allows iOS and Android mobile devices to interact with the PlayStation 4 from their device. The user can use this application to purchase PS4 games from the console and have them remotely downloaded, watch live streams of other gamers, and/or view in-game maps while playing games. "Ustream's integration within PS4 consoles will put gamers on a new media field. They will have the ability to direct, produce, and star in their own video game production, simply by being an awesome (or not so awesome!) gamer." Sony is focused on "social" aspects as a major feature of the console. Although the PS4 has improved social functionality, the features are optional and can be disabled. Users have the option to create or join community groups based upon personal interest. Communities include a discussion board, accomplishments and game clips shared by other members, plus the ability to join group chat and launch cooperative games. Sony stated that "communities are a good way to socialize with like-minded players", particularly when "you want to tackle a big multiplayer raid, but don't have enough friends available". The DualShock 4 controller includes a "SHARE" button, allowing the player to cycle through the last 60 minutes of recorded gameplay to select a screenshot or video clip appropriate for sharing. Media is uploaded seamlessly from the console to other PSN users or social networking sites such as Dailymotion, Facebook, Twitter and YouTube, or else users can copy media to a USB flash drive and upload to a social network or website of their preference. Players can also use a free video editing application named ShareFactory to cut and assemble their favorite video clips, add custom music or voice commentary with green screen effects. Subsequent updates have added options for picture-in-picture layouts, the ability to create photo collages and animated GIFs. Gamers can either watch live gameplay of games which their friends are playing through the PS4 interface with cross-game camera and microphone input, spectate silently, or broadcast their own gameplay live via DailyMotion, Twitch, Ustream, Niconico, or YouTube Gaming, allowing for friends and members of the public to view and comment upon them from other web browsers and devices. If a user is not screen-casting, a friend can send them a "Request to Watch" notification. Share Play allows users to invite an online friend to join their play session via streaming, even if they do not own a copy of the game. Users can pass control of the game entirely to the remote user, or partake in cooperative multiplayer as if they were physically present. Mark Cerny says that remote assistance is particularly useful when confronted by a potentially game-defeating obstacle. "You can even see that your friend is in trouble and reach out through the network to take over the controller and assist them through some difficult portion of the game", he said. Share Play requires a PlayStation Plus subscription and can only be used for one hour at a time. PlayStation 4 games are distributed at retail on Blu-ray Disc, and digitally as downloads through the PlayStation Store. Games are not region-locked, so games purchased in one region can be played on consoles in all regions, and players can sign-on to any PS4 console to access their entire digital game library. All PlayStation 4 games must be installed to the console's storage: users can begin to play portions of a game (such as opening levels) once the installation or download reaches a specific point, while the remainder of the game is downloaded or installed in the background. Updates to games and system software are also downloaded in the background and while in standby. PS4 users will, in the future, be able to browse games and stream games via Gaikai to demo them almost instantaneously. Sony says it is committed to releasing an ever-increasing number of free-to-play games, including PlanetSide 2 and War Thunder. Sony also took steps to make it easier for independent game developers to release games for the PS4 by giving them the option to self-publish their own games rather than rely upon others to distribute their games. PlayStation 4 is not compatible with any game for older PlayStation consoles, including PlayStation 3 and PlayStation 2. Emulated versions of selected PS2 games are available for purchase via PlayStation Store, which are upscaled to high definition and have support for PS4 social features. Selected PS3 games are available for streaming via the paid service PlayStation Now. In December 2013, Andrew House indicated that Sony was planning to launch a cloud gaming service for the PS4 in North America within the third quarter of 2014, with a European launch to follow in 2015. At Consumer Electronics Show on January 7, 2014, Sony unveiled PlayStation Now, a digital distribution service which will initially allow users to access PlayStation 3 games on the PS4 via a cloud-based streaming system, purchasing games individually or via a subscription, as a solution of no backwards compatibility on the hardware of the console. The United States Open Beta went live on July 31, 2014. The official United States release of the service was on January 13, 2015. PlayStation Now is in closed beta in the United Kingdom. "It's abundantly clear that PS4 is being driven as a collaboration between East and West, as opposed to a dictation from one side to the other. Developers are fully involved, activated, discussed and doing really cool collaborative things." Pre-release reception to the console from developers and journalists was positive. Mark Rein of Epic Games praised the "enhanced" architecture of Sony's system, describing it as "a phenomenal piece of hardware". John Carmack, programmer and co-founder of id Software, also commended the design by saying "Sony made wise engineering choices", while Randy Pitchford of Gearbox Software expressed satisfaction with the amount of high-speed memory in the console. Eurogamer also called the graphics technology in the PS4 "impressive" and an improvement from the difficulties developers experienced on the PlayStation 3. Numerous industry professionals have acknowledged the PlayStation 4's performance advantage over the Xbox One. Speaking to Edge magazine, multiple game developers have described the difference as "significant" and "obvious". ExtremeTech says the PS4's graphics processing unit offers a "serious advantage" over the competition, but due to the nature of cross-platform development, games that share the same assets will appear "very similar". In other scenarios, designers may tap some of PS4's additional power in a straightforward manner, to boost frame rate or output at a higher resolution, whereas games from Sony's own first-party studios that take full advantage of the hardware "will probably look significantly better than anything on the Xbox One". In response to concerns surrounding the possibility of DRM measures to hinder the resale of used games (and in particular, the initial DRM policies of Xbox One, which did contain such restrictions), Jack Tretton explicitly stated during Sony's E3 press conference that there would be "no restrictions" on the resale and trading of PS4 games on physical media, while software product development head Scott Rohde specified that Sony was planning to disallow online passes as well, going on to say that the policies were designed to be "consumer-friendly, extremely retailer-friendly, and extremely publisher-friendly". After Sony's E3 2013 press conference, IGN responded positively to Sony's attitude towards indie developers and trading games, stating they thought "most gamers would agree" that "if you care about games like [Sony] do, you'll buy a PlayStation 4". PlayStation 4's removable and upgradable hard drive also drew praise from IGN, with Scott Lowe commenting that the decision gave the console "another advantage" over the Xbox One, whose hard drive cannot be accessed. GameSpot called the PlayStation 4 "the gamer's choice for next-generation", citing its price, lack of restrictive digital rights management, and most importantly, Sony's efforts to "acknowledge its consumers" and "respect its audience" as major factors. The PlayStation 4 has received very positive reviews by critics. Scott Lowe of IGN gave it an 8.2 rating out of 10 praising the console's DualShock 4 design and social integration features. He criticized the console's lack of software features and for underutilizing the DualShock 4's touch pad. The Gadget Show gave a similar review complimenting the DualShock 4's new triggers and control sticks, in addition to the new Remote Play feature, yet criticized the system's lack of media support at launch. IGN compared the Xbox One and the PlayStation 4 over various categories, allowing their readers to vote for their preferred system. The PS4 won every category offered, and IGN awarded the PS4 with their People's Choice Award. Shortly following the launch, it became apparent that some games released on multiple platforms were available in higher resolutions on the PS4 as opposed to other video game consoles. Kirk Hamilton of Kotaku reported on the differences in early games such as Call of Duty: Ghosts and Assassin's Creed IV: Black Flag which ran at 1080p on the PS4, but in 720p and 900p, respectively, on the Xbox One. Demand for PlayStation 4 was strong. In August 2013, Sony announced the placement of over a million preorders for the console, while on the North American launch alone, one million PlayStation 4 consoles were sold. In the UK, the PlayStation 4 became the best-selling console at launch, with the sale of 250,000 consoles within a 48-hour period and 530,000 in the first five weeks. On January 7, 2014, Andrew House announced in his Consumer Electronics Show keynote speech that 4.2 million PS4 units had been sold-through by the end of 2013, with more than 9.7 million software units sold. On February 18, 2014, Sony announced that, as of February 8, it had sold over 5.3 million console units following the release of the PS4 onto the North American and Western European markets. Within the first two days of release in Japan during the weekend of February 22, 2014, 322,083 consoles were sold. PS4 software unit sales surpassed 20.5 million on April 13, 2014. During Japan's 2013 fiscal year, heightened demand for the PS4 helped Sony top global console sales, beating Nintendo for the first time in eight years. According to data released by Nielsen in August 2014, nine months after the PS4 was released, thirty-one percent of its sales were to existing Wii and Xbox 360 owners, none of whom had by then owned a PS3. At Gamescom 2014, it was announced that 10 million PS4 units had been sold-through to consumers worldwide, and on November 13, it was announced that the PlayStation 4 was the top-selling console in the U.S. for the tenth consecutive month. In its first sales announcement of 2015, Sony confirmed on January 4 that it had sold-through 18.5 million PlayStation 4 units. Sony updated the sell-through figures for the system throughout 2015: over 20 million consoles as of March 3, 2015[update], over 30 million as of November 22, 2015[update], and over 35 million by the end of 2015. As of May 22, 2016, total worldwide sell-through reached 40 million. As of December 2018, over 91 million consoles and more than 876 million PlayStation 4 games have been sold worldwide. The PlayStation 4 holds a market share of at least 70% within all European countries, as of June 2015[update]. The PlayStation 4 has been produced in various models: the original, the Slim, and the Pro. Successive models have added or removed various features, and each model has variations of Limited Edition consoles. The slim PlayStation 4 model. On September 7, 2016, Sony announced a hardware revision of PlayStation 4, model number CUH-2000, known colloquially as the PlayStation 4 Slim. 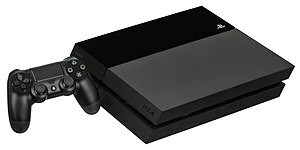 It is a revision of the original PS4 hardware with a smaller form factor; it has a rounded body with a matte finish on the top of the console rather than a two-tone finish, and is 40% smaller in size than the original model. The two USB ports on the front have been updated to the newer USB 3.1 standard and have a larger gap between them, and the optical audio port was removed. This model also features support for USB 3.1, Bluetooth 4.0 and 5.0 GHz Wi-Fi. It was released on September 15, 2016, with a 500 GB model at the same price as the original version of the PlayStation 4. On April 18, 2017, Sony announced that it had replaced this base model with a 1 TB version at the same MSRP. PlayStation 4 Pro (codenamed Neo, model number CUH-7000) was announced on September 7, 2016, and launched worldwide on November 10, 2016. It is an upgraded version of the PlayStation 4 with improved hardware to enable 4K rendering and improved PlayStation VR performance, including an upgraded GPU with 4.2 teraflops of processing power and hardware support for checkerboard rendering, and a higher CPU clock. As with PS4 "Slim", this model also features support for USB 3.1, Bluetooth 4.0 and 5.0 GHz Wi-Fi. The PS4 Pro also includes 1 GB of DDR3 memory that is used to swap out non-gaming applications that run in the background, allowing games to utilize an additional 512 MB of the console's GDDR5 memory. Although capable of streaming 4K video, the PS4 Pro does not support Ultra HD Blu-ray. Games marketed by Sony as PS4 Pro Enhanced have specific optimizations when played on this model, such as 4K resolution graphics and/or higher performance. For games not specifically optimized, an option known as "Boost Mode" was added on system software 4.5, which can be enabled to force higher CPU and GPU clock rates on existing games to possibly improve performance. Rendering games at 4K resolution is achieved through various rendering techniques and hardware features; PlayStation technical chief Mark Cerny explained that Sony could not "brute force" 4K without compromising form factor and cost, so the console was designed to support "streamlined rendering techniques" using custom hardware, "best-in-breed temporal and spatial anti-aliasing algorithms", and "many new features from the AMD Polaris architecture as well as several even beyond it". The most prominent technique used is checkerboard rendering, wherein the console only renders portions of a scene using a checkerboard pattern, and then uses algorithms to fill in the non-rendered segments. The checkerboarded screen can then be smoothed using an anti-aliasing filter. Hermen Hulst of Guerrilla Games explained that PS4 Pro could render something "perceptively so close [to 4K] that you wouldn't be able to see the difference". PS4 Pro supports Remote Play, Share Play, and streaming at up to 1080p resolution at 60 frames per second, as well as capturing screenshots at 2160p, and 1080p video at 30 frames per second. In late-2017, Sony issued a new PS4 Pro revision (model number CUH-7100) that featured updated internal components. The actual hardware specifications and performance remained the same as the original model, although it was found that the revised console has a slightly quieter fan profile than the original (and as a result, operating at a slightly higher temperature under load than the CUH-7000). In October 2018, Sony quietly issued another revision (model number CUH-7200), initially as part of Red Dead Redemption 2 hardware bundles. The revision has a different power supply which uses the same type of cord as the "Slim" model, and was shown to have further improvements to acoustics. ^ a b c O'Brien, Terrence (August 20, 2013). "PlayStation 4 hitting shelves on November 15th in the US for $399, November 29th in Europe". Engadget. AOL. Archived from the original on August 20, 2013. Retrieved August 20, 2013. ^ Phillips, Tom (September 9, 2013). "PlayStation 4 won't launch in Japan until February 2014". Eurogamer. Eurogamer Network. Retrieved September 9, 2013. ^ a b c d e f "PLAYSTATION 4 SALES SURPASS 91.6 MILLION UNITS WORLDWIDE AFTER THE STRONG HOLIDAY SEASON" (Press release). Tokyo: Sony Interactive Entertainment. January 8, 2019. Retrieved January 8, 2019. ^ Romano, Sal (February 1, 2019). "PS4 worldwide shipments top 94.2 million". Gematsu. ^ Anthony, Sebastian (November 22, 2013). "Comparison of Xbox One and the Playstation 4". ExtremeTech. Archived from the original on June 7, 2013. Retrieved December 11, 2013. ^ a b "PlayStation 4 iFixit Teardown". iFixit. Retrieved January 17, 2014. ^ "Introducing the 500 Million Limited Edition PS4 Pro, Commemorating 500 Million Systems Sold". PlayStation.com. 2018 Sony Interactive Entertainment LLC. Retrieved August 10, 2018. ^ "PS4: The Ultimate FAQ – North America". PlayStation Blog. Sony Computer Entertainment, Inc. Archived from the original on October 31, 2013. Retrieved December 11, 2013. ^ Corriea, Alexa Ray. "PS4 will support 4K for 'personal contents' like photos, but not games". Polygon. Retrieved April 26, 2015. ^ a b Long, Neil (September 13, 2013). "Power struggle: the real differences between PS4 and Xbox One performance". edge-online.com. Retrieved September 2, 2014. ^ "The PS4 has finally overtaken the PS3 in Sony's latest financial report". Destructoid. July 31, 2018. Retrieved July 31, 2018. ^ Goldfarb, Andrew (February 20, 2013). "PlayStation 4 Revealed". IGN. Ziff Davis. Archived from the original on February 24, 2013. Retrieved February 21, 2013. ^ Purchese, Robert (March 27, 2013). "PS4 architect knew in 2007 that "clearly we had some issues with PlayStation 3"". Eurogamer. Retrieved October 9, 2018. ^ a b "PlayStation 3 sells out at launch". BBC News. November 11, 2006. Archived from the original on January 8, 2007. Retrieved February 22, 2013. ^ Minkley, Johnny (November 23, 2011). "Sony: it would be "undesirable" for PS4 to launch significantly later than the competition". Eurogamer. Eurogamer Network. Archived from the original on November 25, 2011. Retrieved February 21, 2013. ^ Rougeau, Michael (June 19, 2014). "Destiny developer Bungie and Sony have been in bed longer than you think". Techradar. Retrieved June 20, 2014. ^ Garratt, Patrick (November 2, 2012). "PS4: new kits shipping now, AMD A10 used as base". VG247. Archived from the original on November 3, 2012. Retrieved February 22, 2013. ^ Luke Karmali (December 11, 2012). "Report: Xbox 720 And PS4 Codenames And Details". IGN. Ziff Davis. Archived from the original on January 15, 2013. Retrieved May 21, 2013. ^ Arthur, Charles (February 1, 2013). "PlayStation 4 rumours fly as Sony invitations hint at release". The Guardian. Archived from the original on December 11, 2013. Retrieved September 14, 2013. ^ "Videogame industry's brightest minds convene in New York as part of Sony Computer Entertainment's introduction of PlayStation 4" (Press release). Sony Computer Entertainment, Inc. February 20, 2013. Archived from the original on April 24, 2013. Retrieved February 21, 2013. ^ a b Bishop, Bryan (February 20, 2013). "Sony announces the PlayStation 4". The Verge. Archived from the original on December 7, 2013. Retrieved February 20, 2013. ^ Rivington, James (February 20, 2013). "The PlayStation 4 has been officially revealed in New York!". TechRadar. Archived from the original on April 26, 2013. Retrieved February 21, 2013. ^ Gilbert, Ben (February 20, 2013). "Sony unveils its next game console, the PlayStation 4". Engadget. AOL. Archived from the original on February 21, 2013. Retrieved February 20, 2013. ^ Stark, Chelsea (February 22, 2013). "PlayStation 4 Gets Early Support From Publishers and Developers". Mashable. Archived from the original on February 24, 2013. Retrieved February 25, 2013. ^ a b c d e f g h i j k l m "SONY COMPUTER ENTERTAINMENT INC. INTRODUCES PLAYSTATION®4 (PS4™)" (Press release). Sony Computer Entertainment, Inc. February 21, 2013. Archived from the original on April 24, 2013. Retrieved February 25, 2013. ^ Kelion, Leo (June 11, 2013). "E3: PlayStation 4 console priced cheaper than Xbox One". BBC News. Archived from the original on June 18, 2014. Retrieved June 11, 2013. ^ "PLAYSTATION®4 (PS4™) DESIGN AND PRICE UNVEILED" (PDF) (Press release). Sony Computer Entertainment, Inc. Archived from the original (PDF) on June 13, 2013. Retrieved June 11, 2013. ^ Leandre, Kenn (September 18, 2013). "PlayStation 4 Asia Launch Date Announced". IGN Asia. IGN Entertaintment. Archived from the original on January 5, 2014. Retrieved December 13, 2013. ^ Luke Johnson (December 13, 2013). "PS4 Release Date: PlayStation 4 hits 16 more countries". Trusted Reviews. Retrieved February 19, 2014. ^ "Sony's Playstation to make China debut". The Telegraph. May 26, 2014. Retrieved December 12, 2014. ^ Vincent, James (September 15, 2015). "Sony announces PS4 price drop in Japan". theverge.com. Retrieved July 28, 2017. ^ Barker, Sammy (September 16, 2015). "TGS 2015: PS4's Price Drop Extends to Asia As Well". pushsquare.com. Retrieved July 28, 2015. ^ a b Alexander, Julia. "Sony confirms new, high-end PlayStation 4". Polygon. Retrieved June 10, 2016. ^ Peckham, Matt (June 14, 2016). "We Asked Sony's Gaming Chief About the Future of PlayStation". Time. Retrieved June 17, 2016. ^ Webster, Andrew (September 7, 2016). "Sony announces PlayStation 4 Pro with 4K HDR gaming for $399". The Verge. Retrieved September 7, 2016. ^ a b "PS4 Slim: A smaller, sexier console with surprisingly few compromises". Ars Technica. Retrieved September 7, 2016. ^ "PS4 heading into end of its life cycle, PlayStation CEO says". Polygon. Retrieved May 23, 2018. ^ "The next PlayStation is at least three years away". Polygon. Retrieved May 23, 2018. ^ a b Yin-Poole, Wesley (February 22, 2013). "PS4: PC-like architecture, 8GB RAM delight developers". Eurogamer. Eurogamer Network. Archived from the original on March 2, 2013. Retrieved February 25, 2013. ^ Purchese, Robert (February 22, 2013). "Five analysts, one consensus: PlayStation 4 impressed". Eurogamer. Eurogamer Network. Archived from the original on March 2, 2013. Retrieved February 25, 2013. ^ Crossley, Rob (February 22, 2013). "Sony promises indie-friendly PSN: 'We believe in smaller devs'". Computer and Video Games. Archived from the original on May 26, 2013. Retrieved February 25, 2013. ^ Parfitt, Ben (February 28, 2013). "AMD says PS4's APU is "by far the most powerful" it has ever built". MCV. Archived from the original on April 3, 2015. Retrieved February 28, 2013. ^ a b Taylor, John (February 21, 2013). "AMD and The Sony PS4. Allow Me To Elaborate". AMD. Archived from the original on May 26, 2013. Retrieved February 25, 2013. ^ Shimpi, Anand Lal (May 23, 2013). "AMD's Jaguar Architecture: The CPU Powering Xbox One, PlayStation 4, Kabini & Temash". AnandTech. Archived from the original on December 11, 2013. Retrieved November 9, 2013. ^ Leadbetter, Richard (November 30, 2015). "Sony unlocks more CPU power for PS4 game developers". Eurogamer. Archived from the original on January 4, 2016. Retrieved August 23, 2018. ^ Sinha, Ravi (July 16, 2013). "PlayStation 4 FCC Filing Reveals 2.75 GHz Max Clock Speed Frequency". GamingBolt. Archived from the original on August 26, 2013. Retrieved September 12, 2013. ^ Santos, Alexis (July 22, 2013). "Sony PlayStation 4 waltzes past the FCC". Engadget. AOL. Archived from the original on July 25, 2013. Retrieved September 11, 2013. ^ Femmel, Kevin (February 20, 2013). "Sony reveals the PS4: New controller, 8GB RAM, doesn't play PS3 discs and more". Gimme Gimme Games. Archived from the original on March 16, 2013. Retrieved February 21, 2013. ^ a b c d Leadbetter, Richard (February 21, 2013). "Spec Analysis: PlayStation 4". Eurogamer. Eurogamer Network. Archived from the original on April 19, 2013. Retrieved February 25, 2013. ^ Conditt, Jessica (February 20, 2013). "PS4 allows playing games as they're downloading". Joystiq. AOL. Archived from the original on February 21, 2013. Retrieved February 24, 2013. ^ Williams, Mike (February 20, 2013). "Articles Register Sony reveals developer-centric PlayStation 4". Joystiq. AOL. Archived from the original on April 19, 2013. Retrieved February 24, 2013. ^ Seifert, Dan (February 20, 2013). "Sony PlayStation 4 games can be played while they are downloading". The Verge. Archived from the original on April 18, 2013. Retrieved February 24, 2013. ^ a b c "Inside the PlayStation 4 with Mark Cerny". Gamasutra. Archived from the original on June 18, 2014. Retrieved June 8, 2013. ^ "Sony will wake a sleeping HDR beast via firmware. What else hides in PS4?". Ars Technica. Retrieved September 8, 2016. ^ Kuchera, Ben (January 17, 2007). "Is Blu-ray really a good medium for games?". Ars Technica. Archived from the original on December 1, 2012. Retrieved February 25, 2013. ^ Fletcher, JC (February 21, 2013). "PS4 will output video in 4K, but not games". Joystiq. AOL. Archived from the original on May 21, 2013. Retrieved February 21, 2013. ^ Alexa Ray Corriea (February 21, 2013). "PS4 will support 4K for 'personal contents' like photos, but not games". Polygon. Archived from the original on June 1, 2013. Retrieved February 21, 2013. ^ "PlayStation 4 (PS4) Design and Price Unveiled, Available at $399 in U.S. and at €399 in Europe" (PDF) (Press release). Sony Computer Entertainment, Inc. June 11, 2013. Archived from the original (PDF) on June 13, 2013. Retrieved June 11, 2013. ^ "Sony's PlayStation 4 Eye is a $59 add-on, PS4 packs an upgradable 500GB HDD inside". Engadget. AOL. June 10, 2013. Archived from the original on September 2, 2013. Retrieved June 10, 2013. ^ "PS4 Update 4.50 Now Out, Full Patch Notes Released". PlayStation LifeStyle. March 9, 2017. Retrieved April 2, 2017. ^ a b c "SONY COMPUTER ENTERTAINMENT INTRODUCES WIRELESS CONTROLLER FOR PLAYSTATION®4 (DUALSHOCK®4) AND PLAYSTATION®4 EYE" (Press release). Sony Computer Entertainment. February 21, 2013. Archived from the original on June 18, 2014. Retrieved February 26, 2013. ^ Grant Brunner (June 18, 2013). "Sony issues correction: PS4 will not support analog output [Updated]". ExtremeTech. Ziff Davis. Archived from the original on June 18, 2014. Retrieved June 20, 2013. ^ Spencer (February 20, 2013). "Jump Back Into A Game With PlayStation 4's Suspend Mode, No Save Point Necessary". Siliconera. Archived from the original on June 18, 2014. Retrieved September 13, 2013. ^ a b Pearson, Rob (July 12, 2013). "20 things you didn't know about PS4". PlayStation Blog. Sony Computer Entertainment, Inc. Archived from the original on June 18, 2014. Retrieved July 12, 2013. ^ a b c d e f "The PlayStation 4 controller: A close look at the touchpad, light bar, design, and everything else". ventureBeat. Retrieved October 18, 2017. ^ a b "The PlayStation 4 controller: What's new with the analog sticks and D-pad". VentureBeat. Retrieved October 18, 2017. ^ a b McWhertor, Michael (January 31, 2013). "PS4 touch-sensitive DualShock 4 controller revealed (update: features, scale detailed)". Polygon. Archived from the original on February 23, 2013. Retrieved February 21, 2013. ^ a b c MacManus, Christopher (February 21, 2013). "Finer details about PlayStation 4's DualShock 4 controller, Eye camera". CNET. Archived from the original on May 30, 2013. Retrieved February 21, 2013. ^ Sarkar, Samit (June 11, 2013). "PlayStation 4: What's in the box". Polygon. Retrieved October 18, 2017. ^ "Hands-on with Sony's PlayStation 4 and DualShock controller". The Verge. Retrieved October 18, 2017. ^ "All of the Lights: Many curious uses for the PS4 light bar". Engadget. Retrieved October 18, 2017. ^ Hinkle, David. "Yoshida: DualShock 3 won't work with PS4". Joystiq. AOL. Archived from the original on February 22, 2013. Retrieved February 21, 2013. ^ Gilbert, Ben (February 20, 2013). "The PlayStation 4 supports the PlayStation Move controller". Engadget. AOL. Archived from the original on February 21, 2013. Retrieved February 21, 2013. ^ "PlayStation 4 Controller is PC-Compatible 'for Basic Functions'". Kotaku. Archived from the original on December 11, 2013. Retrieved October 6, 2013. ^ "Sony reveals DualShock 4 wireless adapter for PCs". PCWorld. Retrieved October 18, 2017. ^ "Steam adds support for Sony's DualShock 4 PlayStation controller". PCWorld. Retrieved October 18, 2017. ^ Williams, Mike (January 6, 2017). "Steam Beta Adds Native Support for Xbox One, Xbox 360 and Generic Controllers". USgamer. Retrieved October 18, 2017. ^ Crecente, Brian (September 8, 2016). "Peer into the soulful glow of the DualShock 4's extra lightbar". Polygon. Vox Media. Retrieved October 20, 2016. ^ a b Kyle MacGregor (February 21, 2013). "PlayStation 4 Eye: Applications of PS4's twin cameras". Destructoid. Archived from the original on May 30, 2013. Retrieved February 21, 2013. ^ Scullion, Chris (February 21, 2013). "Eye spy: Has Sony found its answer to Kinect?". Computer and Video Games. Archived from the original on May 30, 2013. Retrieved February 21, 2013. ^ Conditt, Jessica. "PS4 Eye has two cameras: One to watch you, one to make you pretty". Joystiq. AOL. Archived from the original on May 8, 2013. Retrieved February 21, 2013. ^ Sarkar, Samit (March 16, 2016). "PlayStation VR's processing unit doesn't add any power to the PS4". Polygon. Retrieved October 29, 2017. ^ "PlayStation VR review". TechRadar. Retrieved October 29, 2017. ^ "Open Source Software used in PlayStation®4". Scei.co.jp. Retrieved January 2, 2014. ^ Larabel, Michael (June 23, 2013). "Sony's PlayStation 4 Is Running Modified FreeBSD 9". Phoronix. Archived from the original on June 24, 2013. Retrieved September 14, 2013. ^ Humphries, Matthew (June 24, 2013). "PS4 runs modified version of the FreeBSD 9.0 operating system". Geek.com. ^ Hurley, Leon (March 20, 2013). "Michael Denny on PS4's philosophy". Official PlayStation Magazine. Archived from the original on June 1, 2013. Retrieved June 1, 2013. ^ Elton Jones (October 30, 2013). "PS4: No Support for External Hard Drives and MP3s". heavy.com. Retrieved October 12, 2015. ^ HTML5 TEst. "how well does your browser support html5?". Retrieved July 14, 2014. ^ Shah, Niraj (February 22, 2013). "PlayStation 4 will support trophies". XTreme PS3. Archived from the original on May 26, 2013. Retrieved February 22, 2013. ^ Anna Peel. Facebook Inc (FB) Integrates With PS4 For Gamers Identity, ValueWalk, November 15, 2013. ^ Dyer, Mitch (February 20, 2013). "Netflix, Amazon Instant, More Coming to PlayStation 4". IGN. Ziff Davis. Archived from the original on April 15, 2013. Retrieved September 9, 2013. ^ Operating the system with your voice, manuals.playstation.net, October 28, 2014. ^ "Playing videos on discs". PlayStation 4 Users Guide. Sony Computer Entertainment, Inc. Archived from the original on December 26, 2013. Retrieved January 18, 2015. ^ "Media Player Coming to PS4 Tonight – PlayStation.Blog". June 16, 2015. Retrieved November 10, 2018. ^ "Cloud-based TV service PlayStation Vue announced". Gematsu. Retrieved February 5, 2015. ^ Snider, Mike (November 13, 2014). "Sony previews upcoming PlayStation Vue cloud TV service". USA TODAY. Retrieved February 5, 2015. ^ a b Bramwell, Tom (February 21, 2013). "The big interview: Sony's Shuhei Yoshida on PS4". Eurogamer. Eurogamer Network. Archived from the original on April 19, 2013. Retrieved February 25, 2013. ^ Conditt, Jessica (February 21, 2013). "PS4 doesn't require an always-on internet connection". Joystiq. AOL. Archived from the original on May 30, 2013. Retrieved February 25, 2013. ^ Remote Play is available on the Xperia Z2 and Xperia Z3 series, as well as the Xperia Z4 tablet. High speed internet connection required. ^ Loveridge, Sam (September 4, 2014). "Sony Xperia Z3 Remote Play: How to play PS4 games on your phone". Trusted Reviews. Retrieved September 4, 2014. ^ Gilbert, Ben (February 21, 2013). "The DualShock 4 is 'near final' hardware, Remote Play is more than an afterthought, and other notes from Shuhei Yoshida". Engadget. AOL. Archived from the original on February 22, 2013. Retrieved February 25, 2013. ^ Saed, Sherif (April 5, 2016). "PlayStation 4 firmware update 3.50 out tomorrow – full details". VG24/7. Retrieved April 5, 2016. ^ McCormick, Rich (November 13, 2013). "PlayStation app now available on Android and iOS devices". The Verge. Retrieved September 4, 2015. ^ Colin Moriarty (February 28, 2013). "Ustream on Consoles Not Exclusive to PS4". IGN. Retrieved July 10, 2015. ^ a b c Adam Westlake. PS4’s software update 3.00 beta launches, new features detailed, slashgear.com, September 2, 2015. ^ Leon Hurley. Upcoming PS4 update to remove HDCP & let you save Shares to USB Archived August 27, 2014, at the Wayback Machine PlayStation magazine, March 19, 2014. ^ Stuart Platt. New Update for Sharefactory: Track 2, Green Screen and More, blog.playstation.com, June 1, 2016. ^ Stuart Platt. Sharefactory Update 2.0 Out Today, blog.playstation.com, November 9, 2016. ^ "Twitch Confirmed for PlayStation 4". Twitch. August 20, 2013. Retrieved September 14, 2013. ^ Niconico Live Streaming Support Available on PS4 shoryuken.com, April 16, 2004. ^ Andrew Kelly. Share Play in Action on PS4, blog.us.playstation.com, October 24, 2014. ^ Isabelle Tomatis. PS4's Share Play feature in action, blog.eu.playstation.com, October 24, 2014. ^ Prescott, Shaun. "Sony: every PS4 title will be available as digital download". Computer and Video Games. Archived from the original on May 28, 2013. Retrieved February 25, 2013. ^ Smith, Mat (September 14, 2013). "The PS4 won't be region-locked". Engadget. AOL. Archived from the original on June 19, 2013. Retrieved June 11, 2013. ^ Hurley, Leon (July 10, 2013). "PS4's digital library lets you play your games anywhere & on anyone's console". Official PlayStation Magazine. Archived from the original on June 18, 2014. Retrieved September 14, 2013. ^ Jackson, Mike (February 20, 2013). "Gaikai tech brings spectating, instant demos, more to PS4". Computer and Video Games. Archived from the original on May 9, 2013. Retrieved February 25, 2013. ^ Chris Wright. Sony's commitment to free-to-play may be a masterstroke, Develop, July 16, 2014. ^ Shaikh Sehran. 10 Upcoming Free To Play PS4 Games Releasing in 2014/2015, Gamepur, August 5, 2014. ^ Duhaime, Arielle (March 29, 2013). "PlayStation and indie games: a love story". The Verge. Retrieved March 25, 2014. ^ Grubb, Jeffrey (June 10, 2013). "Sony will allow indie devs to publish their own games on PlayStation 4". VentureBeat. Archived from the original on August 23, 2013. Retrieved June 13, 2013. ^ a b "PlayStation 2 games launch on PS4 tomorrow". Polygon. Retrieved December 5, 2015. ^ "PlayStation still not considering backward compatibility for PS4". Polygon. Retrieved December 5, 2015. ^ "Hackers find "official," usable PSP emulator hidden in PS4's PaRappa". Ars Technica. Retrieved June 2, 2018. that the PS4 game uses an in-built PSP emulator to run a copy of the 2007 PSP version of PaRappa rather than running new code specifically ported to the PS4. ^ a b "Sony announces PlayStation Now, its cloud gaming service for TVs, consoles, and phones". The Verge. Retrieved January 7, 2014. ^ "PS4′s Gaikai game streaming service to launch in 2014, Microsoft mum on retaliation". ExtremeTech. Retrieved December 8, 2013. ^ Orland, Kyle (December 3, 2013). "Report: Gaikai streaming coming to PS4 in third quarter of 2014". Ars Technica. Archived from the original on December 3, 2013. Retrieved December 8, 2013. ^ "PlayStation Now Public Beta Starts Today on PS4 With 100+ Games; Check Out This Walkthrough Video". GameSpot. Retrieved April 26, 2015. ^ Wesley Yin-Poole (January 5, 2015). "North America Get a $15-a-Month PlayStation Now Subscription Service". Eurogamer. Retrieved June 20, 2015. ^ Wesley Yin-Poole (March 17, 2015). "PlayStation Now Closed Beta Begins This Spring in UK". Eurogamer. Retrieved June 20, 2015. ^ a b Robinson, Andy (April 2, 2013). "Interview: 'We're more Epic than we've ever been'". Computer and Video Games. Archived from the original on June 18, 2014. Retrieved September 14, 2013. ^ Lynch, David (February 21, 2013). "PS4: 'Sony Made Wise Choices' - Carmack". Nowgamer. Imagine Publishing. Archived from the original on June 18, 2014. Retrieved September 14, 2013. ^ Yin-Poole, Wesley (February 22, 2013). "PC-like architecture, 8GB RAM delight developers". Eurogamer. Eurogamer Network. Archived from the original on March 2, 2013. Retrieved September 14, 2013. ^ Sebastian Anthony. Xbox One vs. PS4: How the final hardware specs compare, ExtremeTech, November 22, 2013. ^ Nutt, Christian (June 11, 2013). "Further clarification on Sony's DRM policies: No more online pass". Gamasutra. Archived from the original on August 12, 2013. Retrieved June 12, 2013. ^ "Sony: No restrictions on preowned PlayStation 4 games". Gamasutra. Retrieved December 8, 2013. ^ MacDonald, Keza (June 11, 2013). "E3 2013: Sony's Knock-Out Blow". IGN. Ziff Davis. Archived from the original on April 13, 2014. Retrieved June 11, 2013. ^ "Media Create Sales: Week 30, 2018 (Jul 23 - Jul 29)". ResetEra. Retrieved August 2, 2018. ^ Lowe, Scott (June 11, 2013). "E3 2013: PlayStation 4 Hard Drive is Removable, Upgradable". IGN. Ziff Davis. Retrieved June 11, 2013. ^ Gaston, Martin (June 11, 2013). "PlayStation 4 is the gamer's choice for next-gen". GameSpot. CBS Interactive. Archived from the original on June 15, 2013. Retrieved June 11, 2013. ^ "PS4 Review — IGN". November 13, 2013. Retrieved January 13, 2014. ^ "Sony PlayStation 4 review by The Gadget Show". November 27, 2013. Archived from the original on January 14, 2014. Retrieved January 13, 2014. ^ "Xbox One vs PS4 - IGN Versus — IGN". January 16, 2014. Retrieved January 23, 2014. ^ Hamilton, Kirk (December 3, 2013). "Why It Matters That PS4 Games Are Higher-Resolution Than Xbox One". Kotaku. Retrieved February 10, 2015. ^ "Media Create Sales: Week 13, 2019 (Mar 25 - Mar 31)". ResetEra. Retrieved April 3, 2019. ^ "Spielekonsolen: Sony zockt Microsoft mit der PS4 in Deutschland ab" (in German). Börse Online. August 17, 2016. Retrieved August 18, 2016. ^ "PS4 reaches 2m sales in the UK". MCVUK. May 5, 2015. Retrieved May 5, 2015. ^ "PlayStation boosts UK team as PS4 sales soar past 3m". MCVUK. March 3, 2016. Retrieved March 3, 2016. ^ Christopher Dring (December 18, 2014). "PS4 smashes 1m sales barrier in France". MCVUK. Retrieved December 30, 2014. ^ Woitier, Chloe. "La PlayStation 4 a été la console la plus vendue en France en 2015". Le Figaro. Retrieved January 21, 2016. ^ "SONY PLAYSTATION CHINAJOY 2018 PRESS CONFERENCE". Niko Partners. August 15, 2018. ^ PS4 Sony has sold 700,000 and 600,000 PS Vita in Spain, elotrolado.net, June 17, 2015. ^ "How is the PlayStation 4 doing in South Africa?". lazygamer.net. ^ Sherr, Ian (August 20, 2013). "Sony Says PlayStation 4 Launches Nov. 15". The Wall Street Journal. Archived from the original on August 20, 2013. Retrieved August 23, 2013. ^ Goldfarb, Andrew (November 17, 2013). "Sony sold 1 million PS4 consoles in 24 hours". IGN. Ziff Davis. Archived from the original on November 17, 2013. Retrieved November 17, 2013. ^ "PS4 beats Xbox One to become UK's fastest ever selling console". The Independent. December 2, 2013. Archived from the original on December 3, 2013. Retrieved December 2, 2013. ^ "PS4 outsold Xbox One by 166,000 consoles in UK last year". January 1, 2014. Retrieved January 1, 2014. ^ Goldfarb, Andrew (January 7, 2014). "CES: PlayStation 4 Sales Pass 4.2 Million". IGN. Retrieved January 7, 2014. ^ Byford, Sam (February 18, 2014). "Sony has sold over 5.3 million PlayStation 4 consoles worldwide". The Verge. Retrieved February 18, 2014. ^ Natasha Lomas (February 18, 2014). "Sony Beats Its PS4 Sales Target, With 5.3M Consoles Sold In 3-Months". TechCrunch. AOL Inc. Retrieved February 19, 2014. ^ Romano, Sal (April 16, 2014). "PlayStation 4 sales top 7 million worldwide". gematsu.com. Retrieved April 27, 2014. ^ "Sony tops game consoles for 1st time in 8 years". Nikkei Asian Review. June 7, 2014. Retrieved December 8, 2015. ^ Eddie Makuch. PS4 Poaching Players From Microsoft, Nintendo, Gamespot, August 26, 2014. ^ Webster, Andrew (August 12, 2014). "Sony has sold 10 million PlayStation 4s". The Verge. Retrieved August 12, 2014. ^ Haywald, Justin (November 13, 2014). "PS4 Tops Xbox One in October NPD, NBA 2K15 and Smash Bros. are Top Games". GameSpot. Retrieved November 13, 2014. ^ Sony (April 30, 2015). "Consolidated Financial Results for the Fiscal Year Ended March 31, 2015" (PDF). Sony. Retrieved April 30, 2015. ^ Moser, Cassidee (March 3, 2015). "Sony's PlayStation 4 Sells Over 20.2 Million Units Worldwide". IGN. Retrieved April 26, 2015. ^ Byford, Sam. "PlayStation 4 sales hit 30 million worldwide". The Verge. Retrieved November 26, 2015. ^ a b "E3 2017: PS4 Sales Reach New Heights". GameSpot. June 12, 2017. ^ a b "PLAYSTATION®4 SALES SURPASS 40 MILLION UNITS WORLDWIDE". www.sie.com. Retrieved May 26, 2016. ^ "PlayStation 4 dominates Europe with '70-90%' of console market". VG247. June 30, 2015. ^ a b c "PlayStation®4 (PS4™) Hardware and Software Unit Sales" (PDF). Sony Supplemental Information for the Consolidated Financial Results for the First Quarter Ended June 30, 2018. July 31, 2018. ^ "PLAYSTATION®4 (PS4™) GLOBAL SALES SURPASS 2.1 MILLION UNITS FOLLOWING EUROPE, AUSTRALASIA AND LATIN AMERICA LAUNCH". www.sie.com. Retrieved May 26, 2016. ^ "PLAYSTATION®4 (PS4™) GLOBAL CUMULATIVE SALES SURPASS 4.2 MILLION". www.sie.com. Retrieved May 26, 2016. ^ "PLAYSTATION®4 SALES SURPASS 5.3 MILLION UNITS WORLDWIDE". www.sie.com. Retrieved May 26, 2016. ^ "PLAYSTATION®4 (PS4™) SALES SURPASS 6.0 MILLION UNITS WORLDWIDE IN LESS THAN 4 MONTHS SINCE LAUNCH". www.sie.com. Retrieved May 26, 2016. ^ "PLAYSTATION®4 (PS4™) SALES SURPASS 7.0 MILLION UNITS WORLDWIDE". www.sie.com. Retrieved May 26, 2016. ^ "PLAYSTATION®4 (PS4™) SALES SURPASS 10 MILLION UNITS WORLDWIDE". www.sie.com. Retrieved May 26, 2016. ^ a b "PLAYSTATION®4 (PS4™) SALES SURPASS18.5 MILLION UNITS WORLDWIDE". www.sie.com. Retrieved May 26, 2016. ^ "PLAYSTATION®4 (PS4™) SALES SURPASS 20.2 MILLION UNITS WORLDWIDE". www.sie.com. Retrieved May 26, 2016. ^ "PLAYSTATION®4 (PS4™) SALES SURPASS 30.2 MILLION UNITS WORLDWIDE". www.sie.com. Retrieved May 26, 2016. ^ "PLAYSTATION®4 (PS4™) SELLS THROUGH 5.7 MILLION UNITS WORLDWIDE DURING THE 2015 HOLIDAY SEASON". www.sie.com. Retrieved May 26, 2016. ^ "PLAYSTATION®4 (PS4™) SALES SURPASS 50 MILLION UNITS WORLDWIDE". www.sie.com. Retrieved January 5, 2017. ^ "SIE Japan GM Apologizes For PS4 Pro And PSVR Supply Issues, Says VR Games Will Improve With Enhanced Tech". Retrieved January 22, 2017. ^ "PLAYSTATION®4 SALES SURPASS 60.4 MILLION UNITS WORLDWIDE". www.sie.com. Retrieved August 17, 2017. ^ "PLAYSTATION 4 SALES SURPASS 70.6 MILLION UNITS WORLDWIDE". SIE. December 7, 2017. ^ "PLAYSTATION 4 SELLS 5.9 MILLION UNITS WORLDWIDE DURING THE 2017 HOLIDAY SEASON". SIE. January 9, 2018. ^ a b c "Game & Network Services Segment Supplemental Information, Q2 FY18" (PDF). Sony Corporation. Retrieved February 1, 2019. ^ "SONY INTERACTIVE ENTERTAINMENT INTRODUCES "PLAYSTATION®4 PRO 500 MILLION LIMITED EDITION"" (Press release). Tokyo: Sony Interactive Entertainment. August 9, 2018. Retrieved August 10, 2018. ^ "Unit Sales of Hardware(FY2013-) | Sony Interactive Entertainment Inc". www.sie.com. Retrieved July 29, 2016. ^ "Digital Foundry: Hands-on with the CUH-2000 PS4 Slim". Eurogamer.net. Retrieved April 25, 2018. ^ a b Thang, Jimmy (February 23, 2018). "PS4 Vs PS4 Pro Vs PS4 Slim: What Are The Differences And Which PlayStation Console Should You Buy?". GameSpot. Retrieved January 8, 2019. ^ "Sony's PS4 Slim now comes with a 1TB hard drive for the same price". The Verge. Vox Media. Retrieved April 19, 2017. ^ Layden, Shawn. "PlayStation 4 Pro Launches Today". blog.us.playstation.com. Retrieved November 10, 2016. ^ Co, Alex (September 7, 2016). "New Official PS4 Peripherals Announced, Includes New DualShock 4, PS Camera and Headset". PlayStation Lifestyle. ^ Conditt, Jessica (September 7, 2016). "The PS4 Pro, as explained by the man who designed it". Engadget. ^ Leadbetter, Richard. "Inside PlayStation 4 Pro: How Sony made the first 4K games console". Eurogamer. Retrieved May 9, 2018. ^ "Sony's new PlayStation 4 Pro can't play 4K Blu-rays". The Verge. Vox Media. Retrieved September 7, 2016. ^ "Sony announces PlayStation 4 Pro with 4K HDR gaming for $399". The Verge. Vox Media. Retrieved September 7, 2016. ^ "The PlayStation 4 Pro vs. the original PS4: What's changed?". Engadget. Retrieved September 7, 2016. ^ "Games with PS4 Pro features will have a 'PS4 Pro Enhanced' on the cover". VG24/7. Retrieved December 31, 2016. ^ Welch, Chris (February 3, 2017). "Sony confirms new PS4 Pro "Boost Mode" will help some older games run faster and smoother". The Verge. Retrieved January 8, 2019. ^ "Tech Analysis: 4K gaming on PlayStation 4 Pro". Eurogamer. Retrieved April 6, 2017. ^ "PlayStation 4 Pro is not a real 4K console". VentureBeat. Retrieved April 6, 2017. ^ "The PS4 Pro, as explained by the man who designed it". Engadget. Retrieved April 6, 2017. ^ "PS4 Pro "Share" grabs 4K screens, caps 1080p video". Polygon. Vox Media. September 7, 2016. Retrieved November 17, 2016. ^ Leadbetter, Richard (November 7, 2018). "PlayStation 4 Pro CUH-7200 review: the latest, quietest hardware revision". Eurogamer. Retrieved January 7, 2019. ^ "PS4 Pro Gets Minor Hardware Update, Changing Model to CUH-7100". DualShockers. October 3, 2017. Retrieved November 10, 2018. ^ Inc, Aetas. "PS4 Pro Jet Black model number changed to "CUH - 7100 BB 01". "With internal parts change, there is no difference in specifications" (translated by Google Translate from Japanese)". www.4gamer.net (in Japanese). Retrieved December 10, 2018. Wikimedia Commons has media related to PlayStation 4.